Los Angeles Police officials were pursuing a possible burglary suspect in West L.A. who eventually drove into a mall parking structure Friday afternoon. 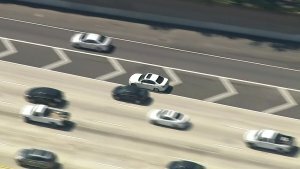 The vehicle appears to be a white BMW sedan with paper plates, aerial video from Sky5 showed.The pursuit apparently started in the Sherman Oaks area and the driver continued along the 405 Freeway, through the Sepulveda Pass and into West Los Angeles. The driver was weaving in and out of traffic at a high rate of speed, often on the shoulder of the highway, aerial video showed. The driver eventually got off the highway and drove into a parking garage on the east side of the Westfield Culver City shopping mall, video showed. Police units surrounded exits on the south side of the complex and it is unclear whether or not the driver was taking into custody. Police asked residents to avoid the area.